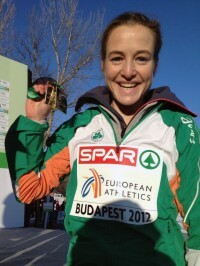 On Sunday, Fionnuala Britton retained her European cross country crown on a snowy course outside Budapest, becoming the first woman in history to successfully defend the senior women’s title. Britton once again battled Ana Dulce Felix of Portugal — the European champion at 10,000m — and ground out a victory over the final four kilometers, notching a two-second victory. Indeed, the weather was difficult as temperatures never went above “freezing” with frozen footing across the snow. But, like Britton, the rest of the Irish contingent took to the tundra-esque conditions and followed her in 8th, 20th, and 23rd to win Ireland’s first team gold in the event, squeaking past France on a 4th-finisher tie-break. Full stories available from Athletics Weekly and the IAAF also feature nice photography, including a shot of our favorite Irishwoman traversing the snow by standout athletics shooter Mark Shearman. The cross country season will now look toward Edinburgh (January 5th) and Bydgoszcz, Hungary (March 24th) for the BUPA Great Winter Run, and World Championships, respectively.